The presidents of Arizona’s three state universities are looking at new ways to generate revenue as they face shrinking state funding. The Greater Phoenix Chamber of Commerce hosted a conversation with the three state university presidents, moderated by Todd Sanders, president and CEO of the Phoenix Chamber. 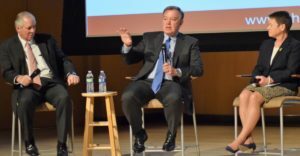 Under the leadership of President Michael Crow, Arizona State University abandoned the public agency model to a public enterprise model. “That kind of opportunity has allowed us to free ourselves from the constraints of a rigid model and allow ourselves to become a high-speed, change-oriented institution,” Crow told the audience at the Musical Instrument Museum. READ THE FULL PHOENIX BUSINESS JOURNAL ARTICLE HERE.